If I haven't mentioned it, I have the loveliest, smartest, sweetest intern working with me from T.C. Williams. Patience is a senior and graduates soon, after which she'll head to VCU for a major in fashion. I've been lucky to have her here even if for such a short time. 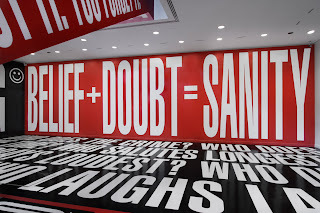 Barbara Kruger, a 60-something artist based in New York, transformed the area into a room full of messages, some funny, some powerful, some provocative but all a thought-inducing. She's well known for "I Shop Therefore I Am"- which you might think is my favorite, but isn't. I do, however, have a few. Topping the list- "Belief + Doubt = Sanity." I'm also a big fan of "Whose Power? Whose Values?" and, finally, as you make your way down the escalator, "Don't Look Down on Anyone." Really, though, there's something for everyone. 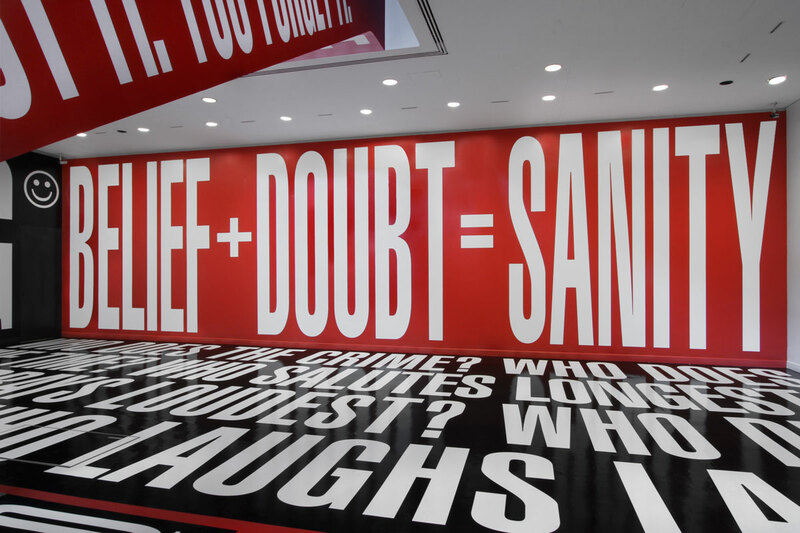 It might make you a little uncomfortable with all those giant letters in black, white, and red surrounding you and getting in your face. But a little uncomfortable is what keeps life interesting, right?